Roman Roslovtsev, 36, has been detained 21 times over his protest actions. A well-known Russian writer and public activist, Roman Roslovtsev, has requested political asylum in Ukraine. The State Border Service of Ukraine has reported the news without releasing his name first. Roslovtsev approached the Chernihiv border unit at the Novy Yarylovychi checkpoint on the Belarusian-Ukrainian border and requested political asylum in Ukraine for political persecution in Russia. "The reason why I decided to request asylum in Ukraine is because I could no longer continue my protest activity in Russia. FSB (Federal Security Service) employees were on duty outside my home in Moscow therefore I took no belongings with me and came here as is," he told Hromadske TV in a comment. 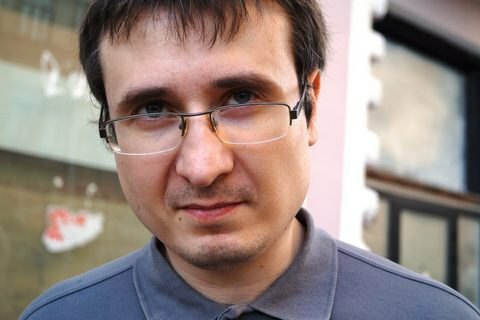 Roslovtsev, who is 36, has been detained 21 times over his protest actions. In 16 cases, offence reports were filled. This is the biggest number of detentions for protests in Russia. On the first anniversary of Ukraine's Revolution of Dignity, he took part in a protest in front of the Kremlin, during which its participants blocked the traffic holding a banner saying "Yesterday Kyiv tomorrow Moscow", lit up flares and burnt an effigy of Russian President Vladimir Putin. Roslovtsev held the effigy. They held a similar protest on 5 December 2014. 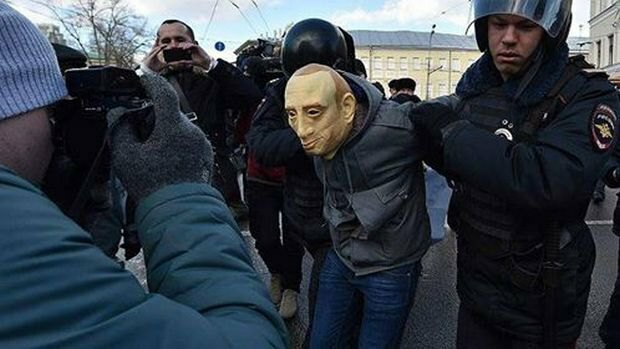 He is best known for wearing Putin's mask during protests. Since February, he has come to the square in front of the Kremlin, wearing the mask and holding a poster "I am not afraid of 212.1", referring to the article in the Criminal Code which says if four offences are committed during street rallies within 180 days, a criminal case can be opened and its participant risks up to five years in prison. All his protests ended with detentions. On 16 June, after yet another detention, he escaped from the convoy at the Moscow city court. He was later found in a friend's flat. Officers of the main directorate for counteracting extremism of the Russian Interior Ministry talked to him until the morning, threatening they would storm the building. He surrendered eventually. Ukraine's foreign minister: EU to lift visas "in coming months"